I currently work as an underwriter for a large insurance company. I never thought I'd be an underwriter -- it's one of those jobs that has no purpose outside the institution of managing money and risk. Apart from that institution, it's a rather purposeless profession, much like telephone sanitation. I decided to go into underwriting because I'm interested in moving up in the company, and getting into the business of the business is the only way to go. The options were either underwriting or claims, and since the folks who I know in claims don't describe their jobs in a positive light, I figured that underwriting would at least be a better experience. The thing about claims is that you really experience the whole range of human experience. A coworker described a situation where a policyholder was recently involved in a collision which killed a family member. Having to deal with the emotional ordeal of handling such a claim doesn't really sound like fun. Much worse is having the subsequent claim be from a man whose brand new BMW had been dinged, and to hear the guy act as though his world was falling apart over it. It's no wonder some of my friends in claims have come out jaded. People could use a dose of perspective. Similarly, I wonder if people would spend less time being self-absorbed if our society wasn't so padded by the middle-class illusion. We'd worry less about trying to be comfortable and complaining about the guy in the fast lane driving too slowly if we had to deal with a serious crisis, like the cyclone catastrophe in Myanmar. Thirteen-thousand dead. A little perspective would do people a lot of good. Update again: I think I'm going to be ill. Now it's up to 120,000. 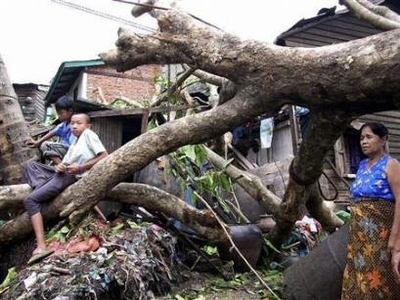 The Red Cross estimated Wednesday that the cyclone death toll in Myanmar could be as high as 128,000 - a much higher figure than the government tally. The U.N. warned a second wave of deaths will follow unless the military regime lets in more aid quickly. Nicely put - all too true. I used to work as a storm adjuster. I handled many total losses some where family members had died. It made me feel good being able to help these people after their loss and relieving part of their burden by having a check in their hands to help get their life back together as soon as possible and walk them through the claims process. My favorite example was in upstate NY after a hurricane. The city had allowed a subdivision to be built in the land above her and the attorney next door had build up the grading on his landscape. All of this water drained on the insured property. It caused her foundation wall in the basement to partially collaspe. She got home in time to brace the wall and keep her house from total destruction. I set an appointment for her in the morning. That night somebody from SF called and denied the claim over the phone, as it is a denied claim. When I got there in the morning she was in tears about the damage and her not being able to take time off from work and she did not think that she would sue the city since it was the state capital and the attorney next door who exacerbated the damage by building up his property wanted to take the case for her, but she did not want him since he contributed to the damage, but did not know how to say no. First I got her to calm down and expalined that the damage would cost $15K to repair and that would only be about a $150 a month payment for a few years which is better then the house collasping. (The glass is half full theory). Next I told her to tell the attorney next door, thank you, but if something went wrong with the case there might be hard feelings between us and I would not want that, so no. Next I explained to her that attorneys make a living out of suing the city, so dont worry about finding an attorney who wants to do that, and finally I told her to screw work. She just had a horrible experiece and that her company could function just fine if she missed 1 day of work and that she should go to the spa and get a massage and gather herself. Even though I denied her claim, she hugged and thanked me when I left. A lot of times claims is what the adjuster makes it. I enjoyed denying a theifs claim, my favorite thing of all. (Thats the evil part of me that loves to do battle) I also enjoyed making a angry person clam. I made it a game to see if I could do it. Next was helping a needy person like above and my 2nd favorite part of a claim was finding coverage for a claim when there should not have been any. Claims can be a great job if you have your head screwed on straight. I don't think it's about having your head on straight -- I think it's more that some people are geared for it and some people aren't. I don't think it's fair to say that people who don't enjoy it (ie., don't feel it's a great job) have their heads loosely attached, you know? I spent a few years as a dispatcher for a private ambulance company. For training, I had to listen to recorded 911 calls and undergo the same training that 911 dispatchers go through. One of the calls was from a woman who was suffering a brain hemorrhage, and during the 1-minute phone call, I listened to her die. The call started out with her complaining about the worst headache of her life, and by the end of the call, she was gurgling as a result of the brain-bleed, and in that situation, there's nothing you can do. That pretty much sealed the deal for me. There are people who will gladly accept a paycheck to deal with that kind of situation on a regular basis. Not me. I've got enough of an emotional whirlwind dealing with 3 small children.